But through the decades, the ministry has expanded to include a range of social services, including art classes. Heckman, the art program’s director, said that providing a safe space for the homeless to create is as important to their recovery as food and shelter. The Stewpot’s art program includes classes throughout the week, art supplies for those in the program, trips to museums, and exhibitions where the artists can display and turn a profit for their work. More than eight years ago, Leon Pollard was with the program when Cynthia Brannum was the art director. In those days, Pollard participated in the Pillar Park homeless project, where he painted the mural of Stevie Ray Vaughan that can be seen near Deep Ellum. 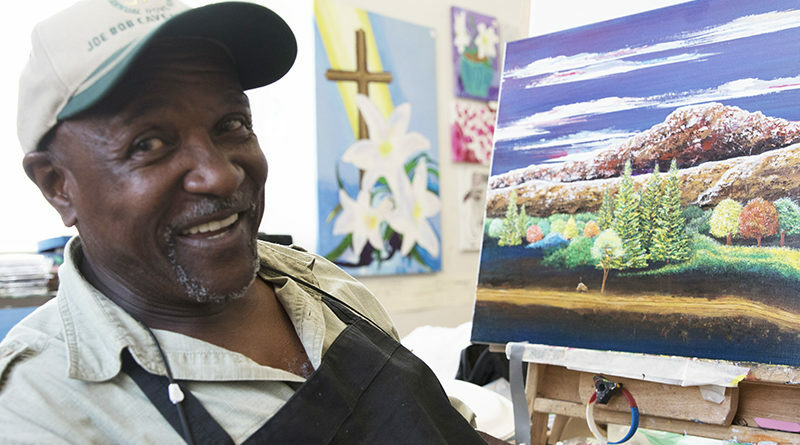 Pollard sees his time with the art program as a respite between being on the streets and working a job. Of all that the program has done for him, Pollards said that visiting and learning from museums is his favorite part. Heckman explained that for those in and around the program, the work done at the Stewpot is about more than just addressing immediate needs. It’s about opening the door for deeper conversations, building relationships, and ultimately creating a space where everyone can feel at home, she said. Pollard describes it as a community.